Home > education > Mr. Kazuki Aoyama and Mr. Yuji Hanada win a Katsuyoshi Watanabe memorial award. 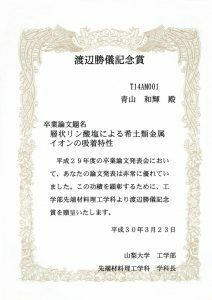 Mr. Kazuki Aoyama (supervisor : Prof. Nobuhiro Kumada) and Mr. Yuji Hanada (supervisor : Assistant Prof. Masanori Nagao) won a Katsuyoshi Watanabe memorial award of the bachelor defence in the Department of Science for Advanced Materials held on March 1-2nd, 2018. 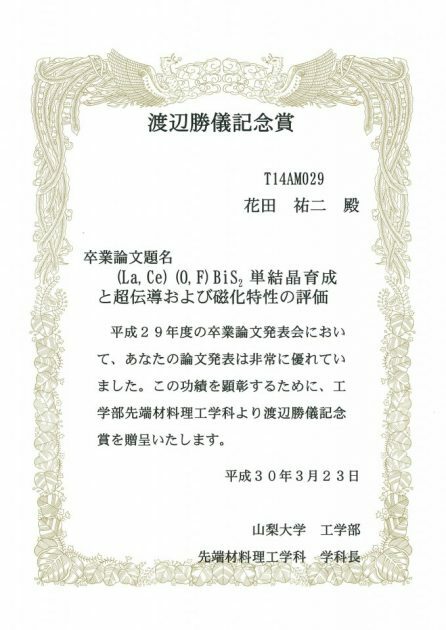 The research topic of Mr. Aoyama and Mr. Hanada are “Adsorption Properties of Rare Earth Cations in Layered Metal Phosphate” and “Growth and physical properties of (La,Ce)(O,F)BiS2 single crystals”, respectively. Five excellent oral presentations were chosen among 34 presentations.